So these costumes are from two Halloweens ago but I figured with the release of the new My Little Pony movie and Halloween just a few weeks away, it might still be useful to someone. 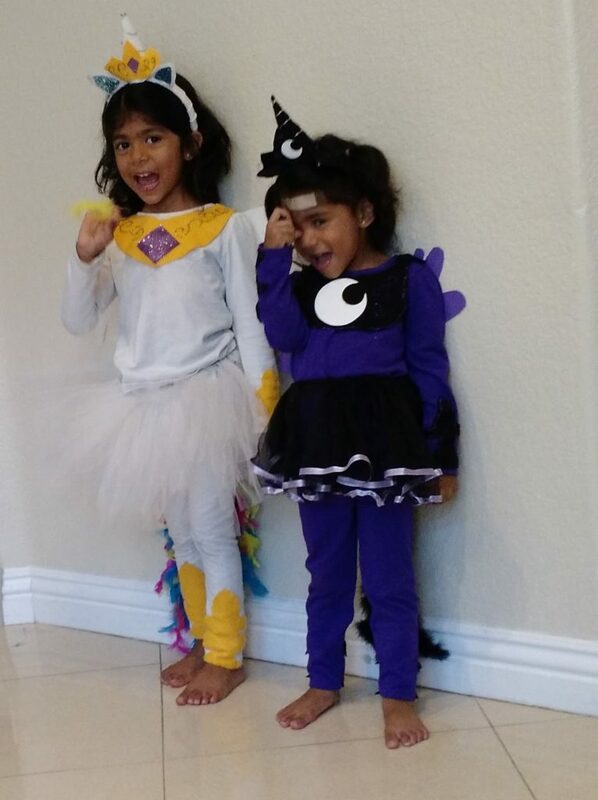 Lucky for me, I had two years in a row with PERFECT costume matches for our little girls. 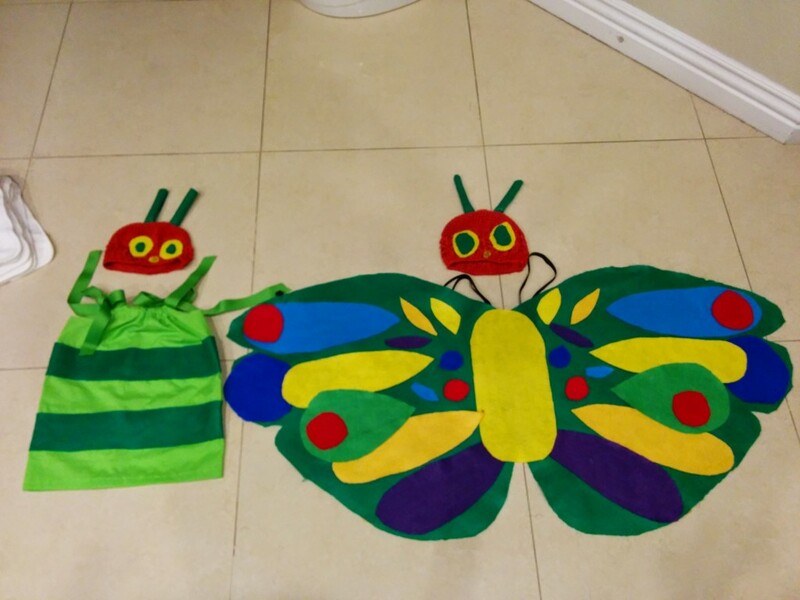 In 2014, we did The Very Hungry Caterpillar and The Beautiful Butterfly. SO appropriate for our kids because at the time, the girls loved the books and our littler one had an awesomely voracious appetite and our older one loved butterflies. Worked out great, Then they came up with this dynamic duo and it was super duper scooper perfect. Celestia and Luna are My Little Pony alicorn princesses who are sisters. My daughters both loved (and actually still do) My Little Ponies, and their personalities match those of the princess ponies. My older one is more sugar and spice and everything nice – rose colored glasses – loves sunny days, just like older sister Princess Celestia. My younger one is just as sweet but her spice comes in a slightly different flavor – her personality is a bit darker, more like Princess Luna (the younger pony). Apologies ahead of time for the quality of visuals in this post – while the girls are spectacular, the pictures themselves are kinda craptacular. Unfortunately, I couldn’t find any costumes for the princesses so I thought I’d try and make them. I pieced them together and the girls loved them. I’m so lucky to have two positive souls. I used this costume set as inspiration. First I made the headband. I used this video as a guide but let’s be real…I was not as thorough or meticulous. 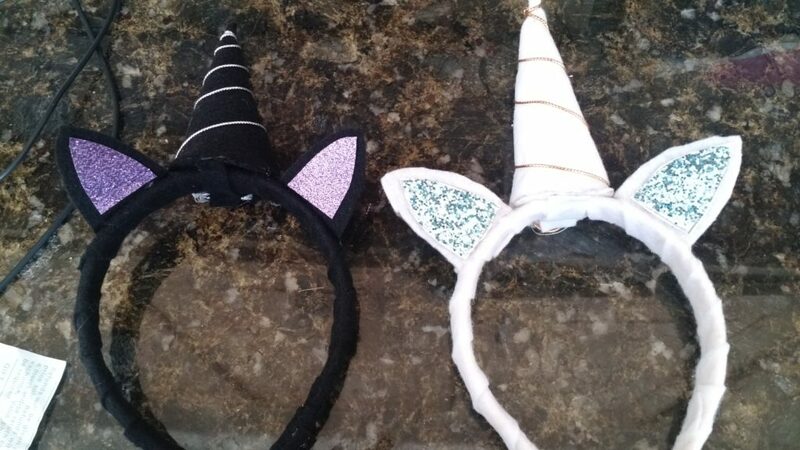 I’m all for using what you have and I had a bunch of blue glitter so I made the ears with glitter, glue, and paper instead of using the glittery sticky paper. 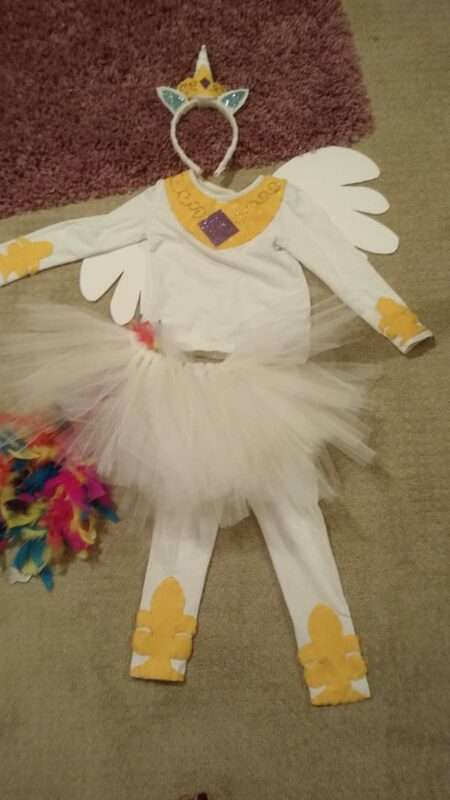 It didn’t hold up as well; my daughter wore her Celestia Costume three times and I had to reapply the glitter after the second time she wore it because so much had fallen off. So I recommend ponying up the extra $.75 and getting the glitter paper. I also made a little crown out of a small piece of yellow felt – I just kinda winged it by folding a piece of cardstock in half and making half a crown that resembled the one in the pictures of Princess Celestia. 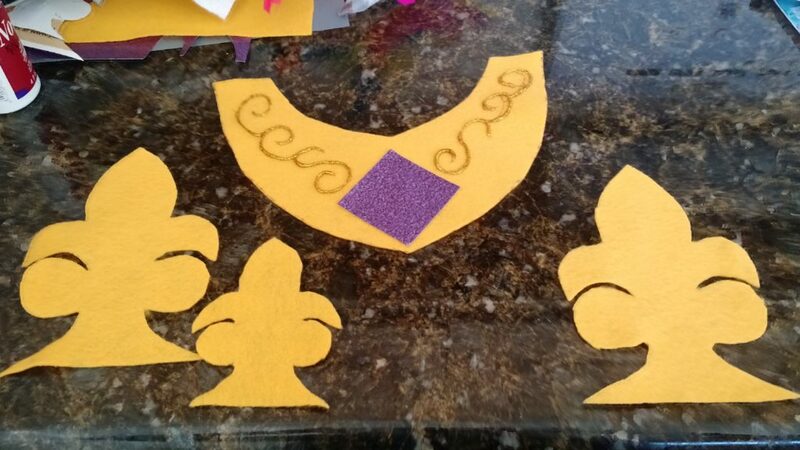 After adjusting to the appropriate size, I unfolded it, traced it onto a yellow piece of felt, added a purple piece of glitter sticker paper cut into a diamond as a gem and used gold glitter glue to add a bit more dazzle. 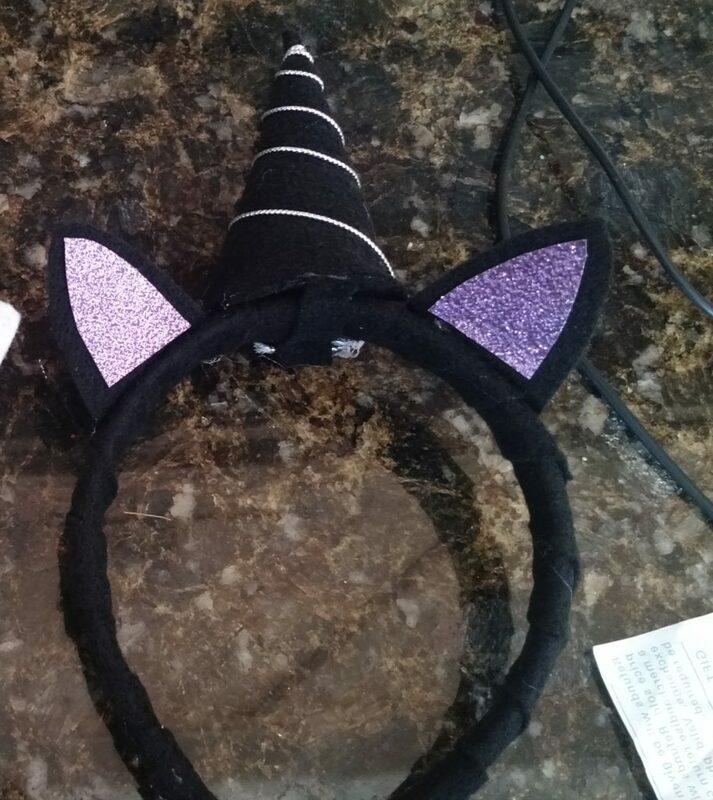 I used a glue gun to attach it to the front of the horn (sorry the pic below is before I put the crowns on). Then I made the adornments. I drew a template on a scrap piece of paper from a magazine, mocking the neckpiece and hoof ornaments as best I could. Like the crown, I folded the sheets in half so that they’d be symmetrical. 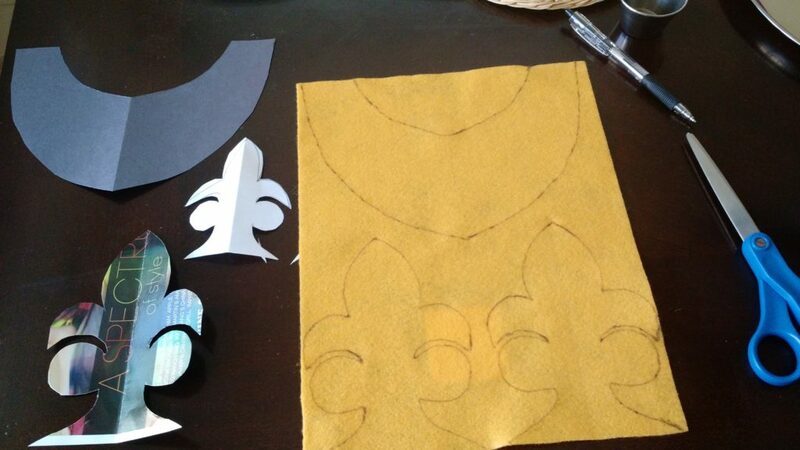 I traced the adornments onto yellow felt and cut them out. Then I used some gold glitter glue to paint on some squiggles. Once the glue had dried, I attached the pieces to the arms and neck on the shirt and the ankles of pants. I just hand stitched them to the pants and shirts but you could just as easily use fabric glue and it would be fine. I then used gold glitter glue along the edge of the adornments to ad a little more pizazz. Luckily we already had white leggings and a plain long sleeve tee-shirt that were inexpensive and lying around the house. If you don’t, check Old Navy, Target, Kohls and Wal-Mart for some cheap options. Technically, you could probably take off the adornments and get some more use out of them but we left them and the girls still play with the costumes. Next came the Tutu. Totally unnecessary but for my four year old, it elevated her excitement so we did it. I used this as a guide with some leftover white tulle I had. Then I measured the length from my daughter’s waist to lower calf and cut the feather boa to that length and tied it to the elastic. I found the boa at Joann Fabric, of course using my 40% off coupon. I will apologize to you in advance…it’s been two years and I still occasionally find these stinkin’ feathers lying around in my girls’ rooms (they still wear the different pieces of the costume for dress up). But I digress…then I googled “Celestia cutie mark” and found a good sized image and printed it on cardstock. Unfortunately the image I used is no longer on an active page so I can’t link it. Kind of the jenkiest part of the costume but basically, I cut out the sun and glued it to where the tutu would be hitting her left hip. Last, I roughly drew a wing about the size of my daughter’s back and cut it out. Then I traced it to a second sheet of foam craft paper and cut that one out as well. I wanted it to have a little more depth so I made a second, smaller wing of a similar shape and glued it to the first. I had to try a few different ways to attach the wings. Ultimately, what worked best was hand sewing the wings onto the shirt. 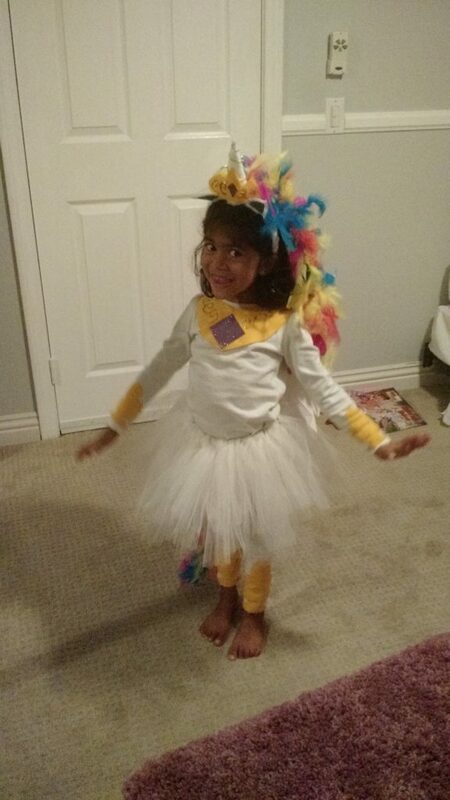 When it came time to wear the costume out, I pinned the remaining portion of the feather boa to her hair to imitate Celestia’s colorful, flowing mane. My daughter loved it. Sadly, I have even less pictures of Princess Luna’s costume but here goes. Next came the adornments. Unfortunately my little Luna had an accident around the time I was working on this part of her costume that included a trip to the ER and follow ups to get her stitches out so I don’t have good pictures of what I did. I drew a template on a scrap piece of paper from a magazine, mocking the neckpiece and hoof ornaments as best I could. Like the crown, I folded the sheets in half so that they’d be symmetrical. I checked the size and shape against the shirt and pants to ensure they were the right size. Make sure that the shape of the neck ornament follows the neckline of your shirt. This is why using templates is a good idea. I printed out this image and cut out the moon cutie mark and attached it to the neckpiece. I traced the hoof adornments onto black felt and cut them out. Then I used some purple glitter glue to paint on some designs. Once the glue had dried, I attached the pieces to the arms and neck on the shirt and the ankles of pants. I just hand stitched them to the pants and shirts but you could just as easily use fabric glue and it would be fine. I decorated the border of each adornment with the purple glitter glue. I found the plain purple long sleeve tee and leggings at Walmart.com but you could also check Old Navy, Target, and Kohls for some cheap options. I (miraculously) already had a black tutu with a purple border FROM THE DOLLAR STORE, YA’LL so I didn’t need to make it. The purple didn’t match exactly (Luna is a dark purple, the tutu had a pastel purple border) but um…my two year old didn’t notice so I wasn’t gonna say anything. If you can’t find one, just google “no sew easy diy tutu” and you’ll find plenty of great tutorials. And honestly, you could even do without the tutu. It just helped my girls feel more princess-y (as if their fairytale lives with their mother wasn’t enough). I found a black feather boa at Michaels and pinned it to the back of the tutu. I folded it a few times to make it the right length and to add volume. My daughter’s hair is black so I didn’t add any to her hair for a mane but you could. I printed this cutie mark out on cardstock, cut it out and glued it to where the tutu would hit her hip. Finally, I created wings on purple craft foam sheets. The shape of Luna’s wings were more upright vs. Celestia’s broad, flowy wings. I used pencil to draw out one wing (I had to erase and do it a couple times to get it right. Once I cut it out, I traced it a second time and cut it out. Then I made a second layer of wings, following the same shape but smaller. I glued the smaller wing atop the bigger wing and then attached it to the back of the purple shirt. I just made big stitches by hand. These costumes were fun to make and pretty inexpensive. Honestly, though they’re not the most elaborate or spectacular costumes, I’m proud of them and the girls were happy and proud to wear them. And they helped put them together so it was quality time for us. Good luck and I hope everypony has a Happy Halloween! Over the last five years or so, I’ve been whittling away at a bunch of the areas of our lives where we are wasteful or unkind to the earth. It started with an electric car and cloth diapers and has spread into so many things we use and do. I make homemade dishwasher detergent and bathroom cleaner. I hardly use paper towels. I try to use reusable containers instead of foil, saran wrap, etc. One area that continues to eat at me is food waste. I will say that we’ve cut back dramatically on food waste just by eating at home more. I am happy to say that one of my original goals from when I started the blog was to eat dinner at home at least four nights a week. It’s kind of crazy to think that we were eating out THAT much that it was a goal for me to eat at home four days a week. These days we go out for dinner maybe once or twice a week and it’s no big deal. Actually, what is kind of a big deal for me is to figure out what I can make that everyone in the house will enjoy. All this experimentation results in food waste. My kids aren’t super open minded when it comes to trying new foods. Sometimes I look at what my family has eaten over the course of a day and I feel like a failure. It’s a terrible feeling to think that you’re failing your family. But I keep trying. Today I was cleaning out the refrigerator since tomorrow is garbage day. It had been a few weeks since I dug through the back of the fridge so there were several containers that needed to be cleared out. In fact, I was pretty much out of containers with lids so I knew I needed to do it. It was like a jab to my gut everytime I opened a container and dumped out the contents. A cup of pumpkin. A small container of sweet potatoes that no one cared for. Left over rice and dahl. Millet that I probably wouldn’t salvage. A bit of arugula that didn’t get eaten in time. Some questionable looking strawberries. It was a lot this week. But then I started thinking about it and realized there was an upside. Pretty much everything that I threw away was a small left over portion of something I had tried. And pretty much everything was a whole food that I was throwing out. Years ago, I remember always throwing out produce because I never got around to making the things I thought I’d make. Well now I’m making them. The pumpkin was what was left after I made pumpkin muffins for the girls to snack on. The sweet potatoes were left after I attempted to mash them but no one cared for them. Most of the strawberries were eaten; just a few were left because I had bought a large container and then my mom brought more. And I’m also noticing that more and more of the trash we produce is organic waste (which reminds me, it’s time to get back on the compost train!!!) – so instead of having overly processed foods, we’re eating more real foods, in general. We’re not entirely where I wish we were, but you know what? We’ve made great progress in the last five years. It’s only Tuesday this week and already I’ve put my wok, food processor, blender, and slow cooker to work. And don’t get me started on how badly my knives need to be sharpened from constant use! So, no, food waste isn’t a good thing but I will say that this week it helped me recognize that we’re eating better AND it reminded me that I really am trying to feed my family healthy foods. It’s not a failure. It’s a step along the path of a journey. I’m going to keep at it. Side note: Today my five year old literally started crying when she saw what I had made for dinner. Real tears, folks. I had tried a new recipe for Crunchy Stir Fry Zen Bowls (I thought they were beautiful looking and they tasted pretty good to me!) and asked her what she would like instead. She said she wanted to make her own dinner. “Out of what?” I asked. “Apples, cabbage – I want purple and green both, and cucumbers and I want a tortilla to put it in.” Huh. Really?!?!? I put some spinach on her plate along with a whole wheat tortilla, some apple slices and the cabbage she asked for and she stuffed it into an overflowing burrito and she ended up eating the majority of it. Her meal was healthier than the one I had made for her! So ya, we threw away some food but there was a bigger portion that went into her growing body. Super S is three years old. I feel the need to talk about her. I’d post pictures but wordpress is acting funny and won’t let me upload them. Argh! She has so much going on and I don’t want to forget what she’s like right now. Every day I feel her babyhood slipping further and further behind us and I am excited about the things ahead of us but I’m also mourning the stage in my life where we have babies in our house. This post IS going to be about her but for a minute I need to talk about me. I struggled with Sia turning three. We’ve decided that we’re done having kids. And it’s the right decision for us. Our family is complete. It is. But holy moly. I love infants. I’m not pretending that those impossibly hard months of no sleep and being depended upon for everything don’t exist. I’m not saying that there’s no real, physical, and mental blow to one’s being as a result having a newborn. There is. I’m just saying it’s worth it and I’m sad to see that part of my life gone. Before I had kids, I remember wanting that feeling of a little person’s head on resting on my shoulder. And that’s really really nice. But having been a mom to two little ladies, the stuff that I think I miss the most? That look of sheer, unadulterated joy and adoration when you pick her up out of her crib. That quiet time when no one else and nothing else in the world exists but the two of you. Those moments when you know, without a doubt, that there is nowhere else your child would rather be than with you. Her explosive stretch when you undo the swaddle followed by her unbelievably soft warm body next to yours when you pick her up after a nap. Knowing that she trusts you more than anything. Sorry if there are typos in this. I’m bawling. So it’s come to be. I’m that woman. You know her. I catch myself staring at carriers covered with blankets, waiting for the moment it passes at just the right angle so I can get a peek at the delicate sleeper inside. (I swear I’m not a creeper) A few days before Super S’s birthday, I heard a baby crying in the parking lot. I could tell it was a little baby. It made me cry. I’ll miss this part of my life. My baby is a tiny little girl now. I have so much to look forward to. I know that. Let me tell you about my little lovely as she is today. Sia is a happy child. Her enthusiasm on the inside bubbles over to her voice and she uses her entire body to talk. She’s fast. She runs fast, she talks fast, she jumps fast, she climbs fast. She loves blue. In fact, we didn’t have much of a theme for her third birthday party – just blue. She loves her sister and picks up all kinds of things from her, especially speech and phrases. She was half asleep the other night and (I don’t know why I did, but I did) I asked her who her best friend was. She said “Kayeena,” her big sister. She’s also a big big fan of her dear old dad. She’s been doing this thing lately where she calls out each of our names when we’re getting ready to back out of the driveway. Usually it’s just me and the kids while my husband is at work so it goes something like this: “Sia! Ahoy! Karina! Ahoy! Mama! Ahoy! Daddy! Not ahoy.” And she says that last one so sadly. She misses him when he’s at work. In 2015 we took her to the emergency room twice. Once at the beginning of the year because she had a super high fever and was becoming lethargic. Turned out she had pneumonia. The second time was because she tripped and hit her head on the corner of a baseboard. She needed stitches. It freaked me out – I could see her skull. She was amazingly brave, though. And actually I stayed calm, considering how scared I was on the inside. I’m hoping she got all the emergency room visits out of her system and we’ll never (ever) have to go again. A girl can hope, can’t she? She’s currently in speech therapy. We found that while she understands way more than we expect her to, she was getting frustrated often because people couldn’t understand her. So we had her tested a few times and not surprisingly, she was advanced in her comprehension abilities but right at average for her speech. At first they dismissed her as not needing therapy until one of the therapists did a specific test and realized she was making a massive amount of sound substitutions. We have been going to speech therapy for the last few months to help her with her pronunciation. I don’t know how much of her improvement is due to speech therapy and how much is just that she’s getting older and is developing more tone and muscles in her face and mouth but she’s definitely improving. Favorite joke – “why did the pink panda go to the doctor? Because he was pink!” She loves telling this joke! Loves pesto, pasta, strawberries, watermelon, BUTTER (omg butter), milk, bagels, steamed carrots, cheese, varan/bhath, beans and rice, waffles (with honey), french fries/tatertots/hash browns, pancakes, smoothies and popscicles made from smoothies, Applesauce (please stop with the apple sauce! ), quesadillas, chips and all kinds of treats. Still twirls her hair to the point where her finger gets stuck. Doesn’t even realize she’s doing it. She mindlessly pulls and plays with my hair and sometimes Karina’s. 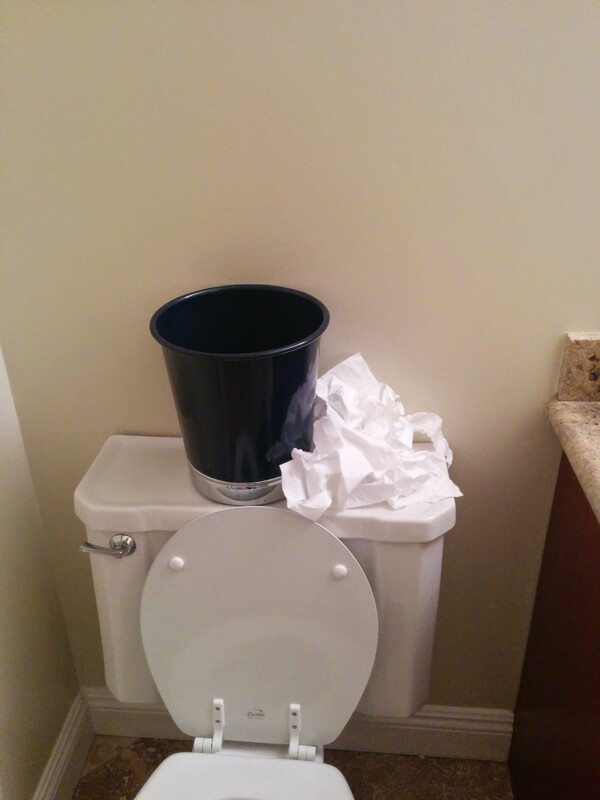 No longer uses a step or a potty seat for the toilet. Goes by herself. Hallelujah! She’s a great kid. 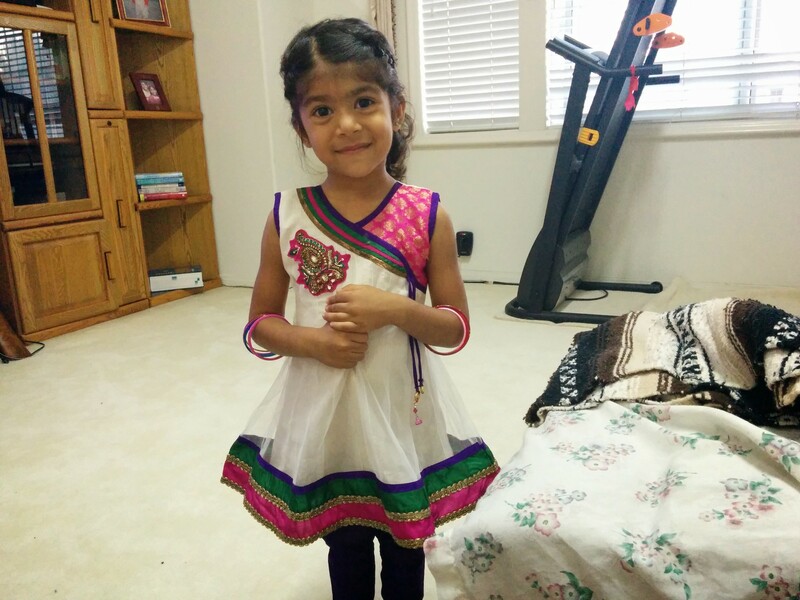 She has mellowed out since turning three – she was definitely a feisty two year old. We were worried for a while that her temper would cause her strife in her life or that maybe she wasn’t as kind as we would like her to be but now that she’s better able to express herself, we’re seeing a very compassionate and sweet person. 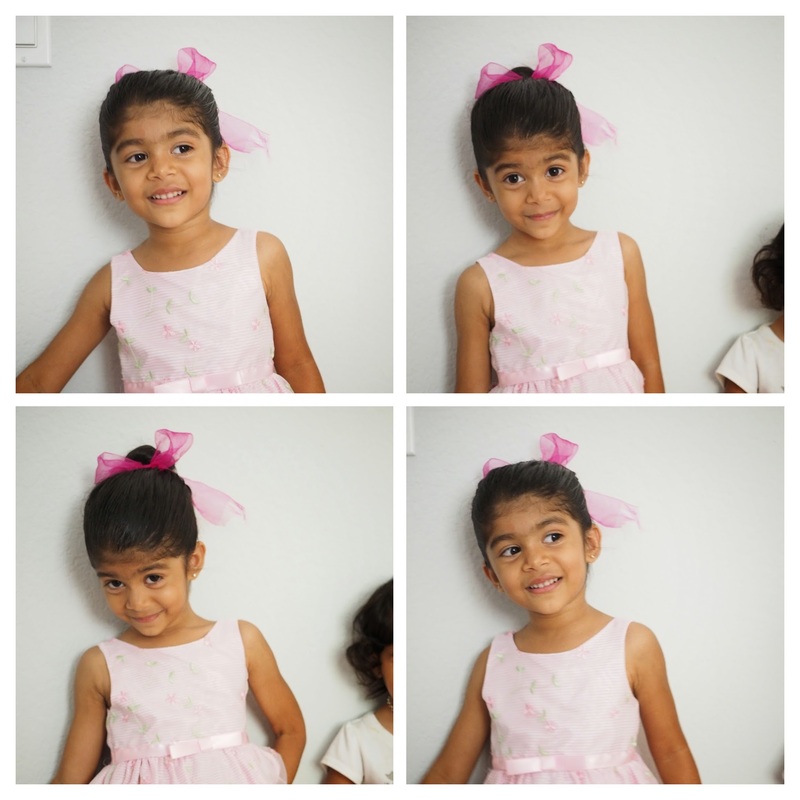 When her sister is upset, she will say “It’s ok, Kayeena” with a very concerned face and will find words to soothe her. Sometimes she sympathy cries with her. It’s hard not to laugh when that happens. I think one of the things that’s calming her down a bit is that she can better express herself. She’s got a killer smile. When she feels shy or overwhelmed by new people or places, she grabs onto her big sister and hugs her. She’s smiling, so I think she’s ok but I think being close to Miss K brings her comfort. I love this girl. For who she was, who she is and who she will be. So this post is about a year late but I figure the timing is still right. Miss K’s taste in costumes has become increasingly more complex over the last several years. When she was 10 months old, I decided she would be a flower for Halloween. At a year old, I decided she’d make an adorable elephant (she did). At two years old, SHE decided she wanted to be an alligator princess. Luckily Carter’s made an alligator costume that year so I pinned a crown on it and called it a happy Halloween. 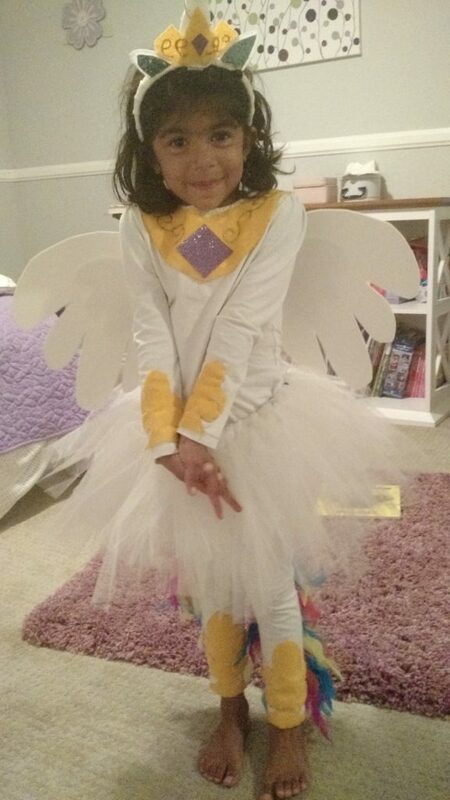 Last year, at three years old, she said she wanted to be a “half rainbow, half Anna and Elsa butterfly.” Sigh. Seriously? 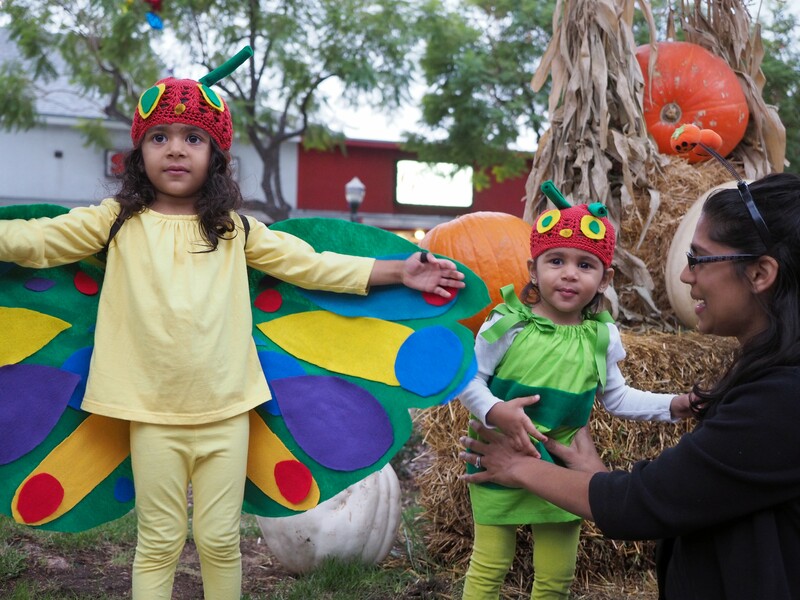 After thinking about it a bit and coming across some super duper cute costumes, I (skillfully) suggested that it would be fun to be the beautiful butterfly from The Very Hungry Caterpillar and to make things better, her sister could be the caterpillar! It was so. stinkin. perfect. Super S WAS a very mobile, hungry little girl and she was at an earlier stage than her big sister, who was actually very fluttery (and of course beautiful). So she agreed. But then I realized I needed to get costumes. Couldn’t find any that I liked so I took a dive and decided to just make them. It was actually fun putting them together. They weren’t perfect but my kids enjoyed helping and I was proud and they loved wearing them. So all in all, it made us happy. Using this post as inspiration, I used this tutorial as a guide to put together the dress. I could try and spell it all out for you but she does a much better job than I could ever do. I didn’t even bother using my sewing machine, though. I just made hand stitches (there are just so few) and then cut pieces of green felt for stripes and sewed those on as well. I think it took an hour, tops, and I don’t even really know how to sew. I had considered making my own beanie but then spotted a crochet hat at Joann Fabric and decided that, for my first foray into costume making, I should keep things as simple as possible. I simply cut out some yellow and green circles for eyes and used some fabric glue to attach them. Also made a little bitty nose and colored it brown. 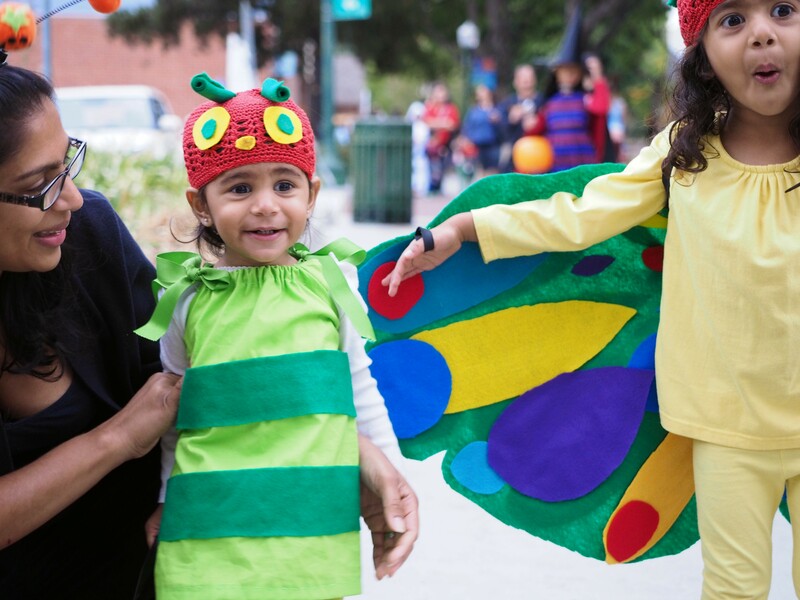 The best part about these costumes is that Eric Carle’s art doesn’t have perfect lines; they feel a little messy or imperfect. 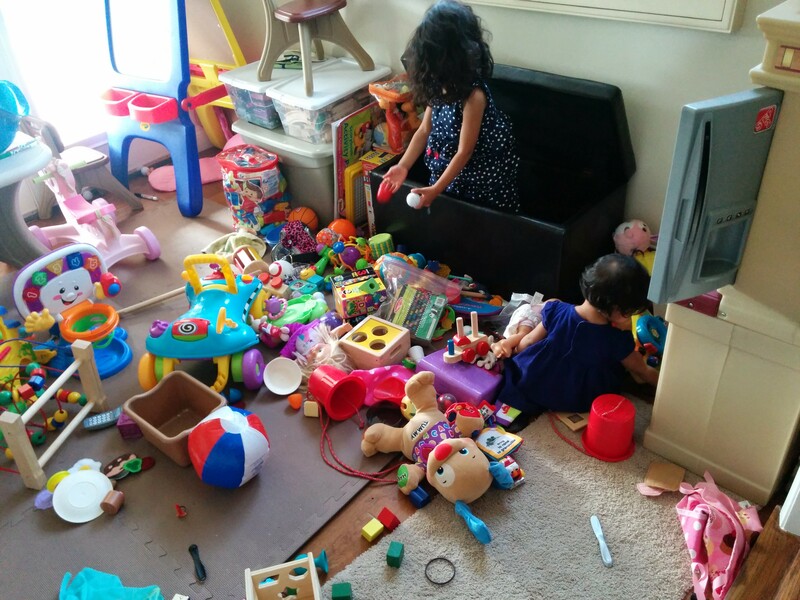 Good thing messy and imperfect are areas that I have extensive expertise! Back to what I did…I then rolled up two pieces of felt and sewed them into the beanie. This was the part of the costumes that I was most bothered by. I couldn’t get the antennae to stand up straight. They didn’t bend but kept flopping over. If anyone has suggestions on that, PLEASE comment below. I picked up a pair of bright green tights from The Childrens Place and the Hungry Little Caterpillar was set! 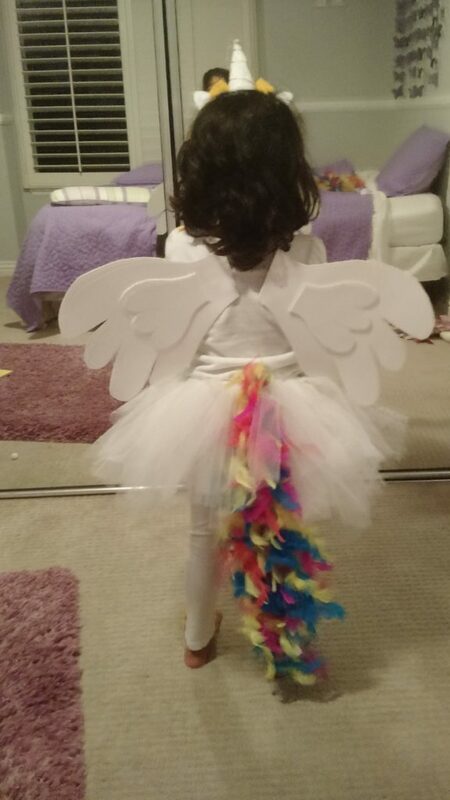 For this costume, I used this tutorial as a guide but decorated the wings differently and also didn’t bother making a stencil. I measured her wingspan from wrist to wrist and made sure my felt piece was the same width at the widest part. I just drew on the piece of felt and “winged” it (see what I did there?). Same with the pieces that I attached to decorate the wings. I kept the book open in front of me and tried to best reproduce some of the designs/patterns. It’s pretty tough to recreate due to the shades and shapes of the actual picture but I did my best. I made circles, tear drop shapes, and used scraps to fill in the empty spaces. I actually cut four of the same shapes and glued the pattern on both sides of the wings so that Miss K would look good from the front or the back. I’d suggest laying out your pattern first and then gluing down. I used the same process as above for the beanie. I had a hard time finding yellow leggings so I took a pair of $4 leggings from Target and dyed them with Rit dye. I was so excited to see that the color matched pretty darn close to the yellow shirt she had in her closet! 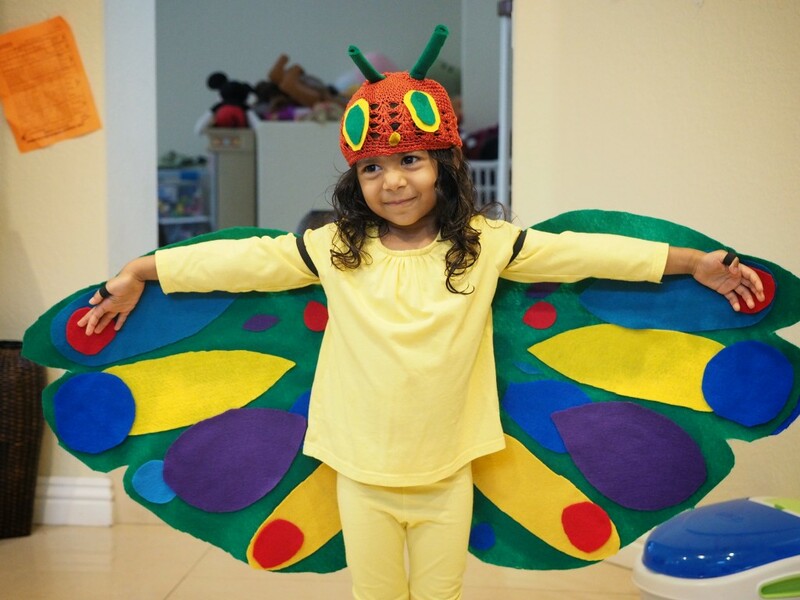 She LOVED being the butterfly for Halloween. Even when we were handing out candy, she would spread her wings dramatically once we had opened the door so she could show the trick-or-treaters. It was awesome. Outside of the research and gathering materials, I’d say these costumes took no more than 3-4 hours total. I won’t lie. A couple days before Halloween, I was having doubts about our homemade costumes and almost made a trip to Target to buy something else. I was worried no one would know what they were or that the girls would look silly. I sent a picture of the costumes to a couple friends and they knew right away what they were and they said the costumes were awesome. And we did receive compliments while we were out, so that’s always nice too. In a sea of Elsas, it was nice to feel unique. But above all, my girls loved being in the costumes and they enjoyed making them together. I’d call that a success! Good luck and share if you’ve made similar costumes! Growing up, I didn’t have grandparents. Well, technically I did. I had a maternal grandmother and a paternal grandfather that both lived in India. I was born and raised here and in our simple little imaginations, my brother and I suggested multiple times that they should marry each other. We had never really known them. 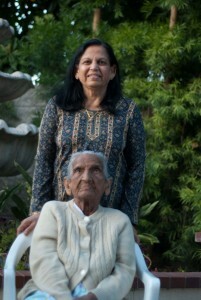 My grandmother fought my Mom off for years when it came to coming to America. She was a widow and only had one living child – my Mom. But her health started failing and my parents insisted and went to India and brought her back home with them. So at last, at 20 years old, I had myself a Ba. She lived with my parents in the guest room downstairs. She was legally blind and came with a slew of health issues that my parents diligently cared for. After about a year, her health improved enough to where she was pretty comfortable. 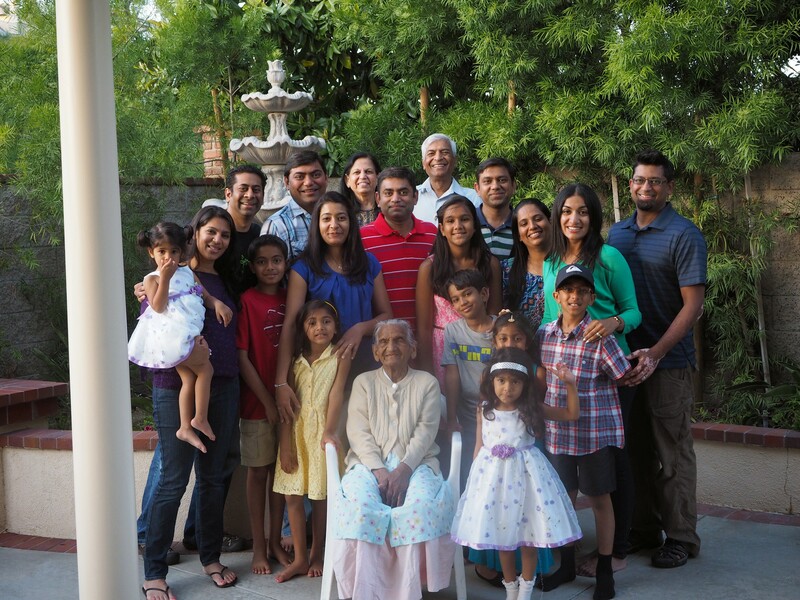 My gujarati language skills improved dramatically and we taught each other all kids of things. She asked about me the days of the week, “Monday, Tuesday, Birthday?” and I FINALLY learned to count past 16. Despite coming from a different world, she never (ever) commented on my choice in revealing clothing, the way I came home late at night, the way I had male friends visit, or even that I ate meat. You have to understand that for someone of her generation from where she was from, this is pretty remarkable – all of those things were pretty “bad.” She only had a sixth grade education but in many ways, her mind was open and accepting. When I was around 23 years old, I came home for a visit (I think I lived in LA so I’d come by on weekends) and she said “All my responsibilities are over. I have lived a good life. The only thing remaining is to see you get married.” Sigh. 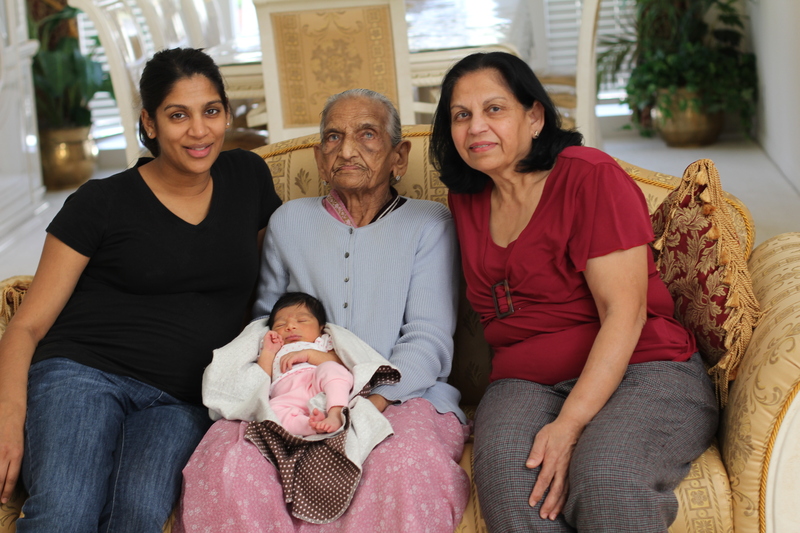 Oh, the guilt trip laid forth by Indian mother is amplified many-fold when that mother is a grandmother. But lo and behold, three years later, I was engaged. I don’t know if she told me things because I was her only granddaughter or because she wasn’t comfortable telling my mom, but she did. She seldom showed my mother compassion or a soft side but frequently praised her and showed sympathy for her daughter by telling me. In the 19 years she was here in the US, I only saw her cry once. At my wedding. She loved me. I know she did. She could never say it to me. She could never praise me, but she loved me. Fast forward a few more years and her kidneys really started failing. A few months before we found out we were pregnant, she was hospitalized. She went through the speech again about how her responsibilities were through and she was at peace with her life but the only thing left is that she hadn’t seen was my kids. 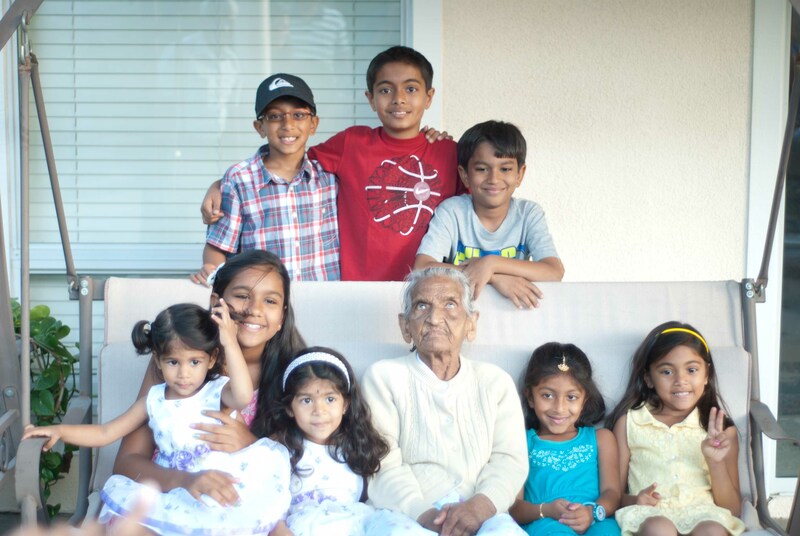 Mind you, at this point, she had eight great grandkids…but she had a funny way of motivating. 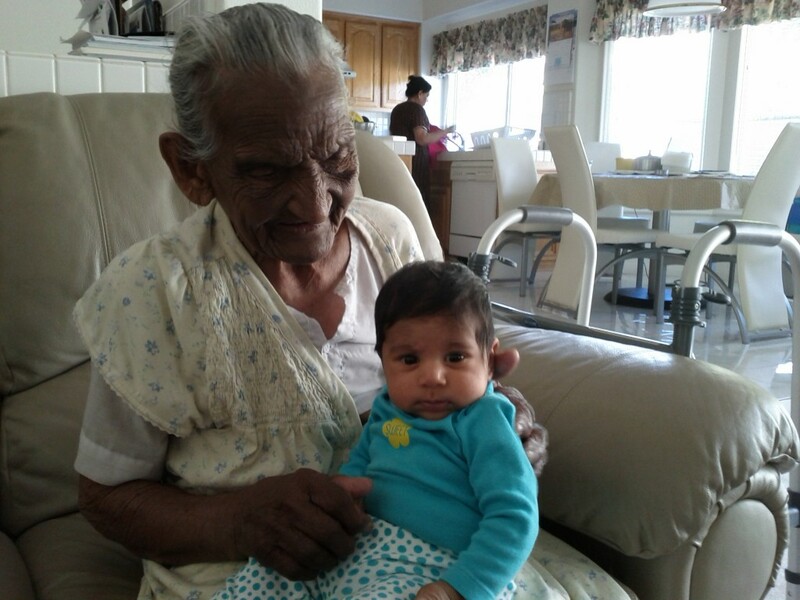 I wasn’t sure she’d be around long enough to meet great grandchild #9 but she was. And then even #10. The last five years have been difficult for her and my parents as caretakers. She was going to dialysis 3-4 times a week, on a myriad of medications, having back pain; all kinds of stuff. But she still bathed herself, went to the bathroom by herself, brushed her teeth and combed her hair by herself. My parents became less comfortable leaving her at home alone. Even when they did, mom would be worried about her and couldn’t enjoy. The truth of the matter is that her body was failing her. She did the dialysis for over four years. All the while, I couldn’t help but wonder what she was getting out of this life she was living. When I think about all that she had seen in her life – poverty, the deaths of several of her children and her husband, coming to a country where she didn’t speak the language – I’m in awe of her resiliency. What on earth would keep her keepin’ on? Yes, she loved her baths – she would be in the bathroom for literally 4+ hours. 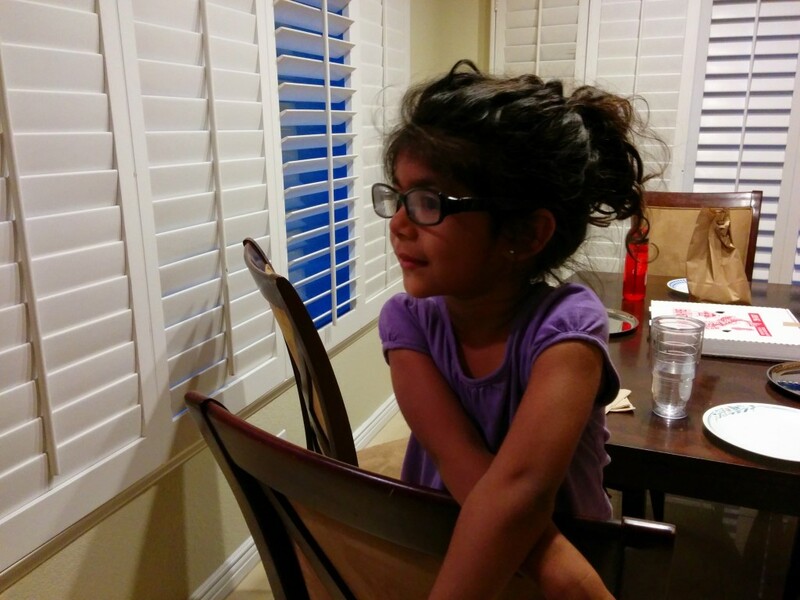 She liked watching the news and for a while she even watched Indian soap operas. But I think it was us, her family, that kept her going. We somehow brought her joy. 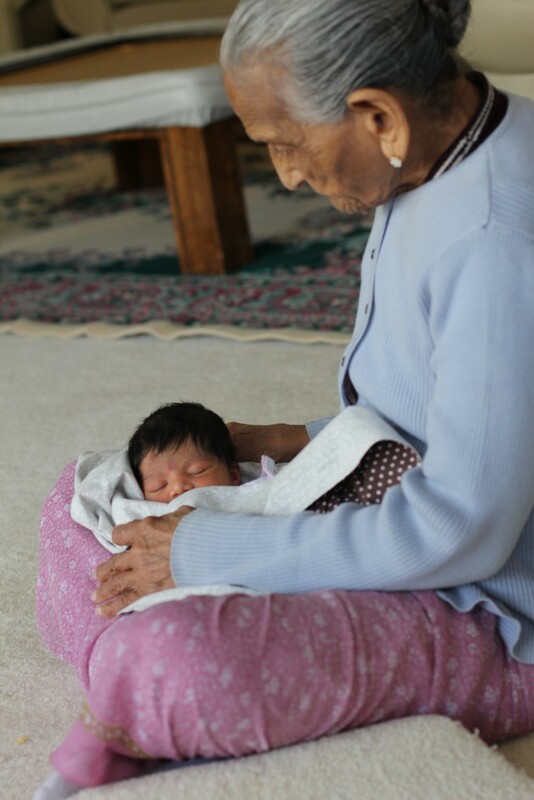 She’d be exhausted but if one of her great grandkids showed up, she perked right up. She would try to lift my little ones. She would offer to watch them so I could eat (I mentioned she was pretty much blind, right?). Despite the effort, she would come to the garage door to wave goodbye to us as we left. She couldn’t see us waving back but I’m thinking maybe she could feel it. Although her body starting failing her, her mind was sharp as a tack. Remembered every birthday, anniversary, and obscure relationship between people she barely knew. So when she said she didn’t want to go to dialysis, we listened. In the past, there had been days when she was tired and frustrated and fed up and upon returning home from dialysis would say she was done. But sure enough, she’d be dressed and ready when the next appointment day came around. This time was different. She had her normal dialysis on Friday. On Monday she said she didn’t want to go. She was calm. Not angry. Not upset. Just matter of fact. My parents ensured that she knew what this meant. They rescheduled for Tuesday just in case. My cousin came over and tried to convince her. No dice. She was done. Home hospice care was the next step. The nurse was kind and the process really helped to put things into perspective. To all of our surprise, she lasted almost two weeks without dialysis. This is mostly because she wasn’t drinking or eating much. It was a weird time in our lives, waiting for her pass. It was scary and peaceful and just plain weird. But it was comforting knowing that we didn’t have to wish or hope or fight for things to turn around. The goal was to keep her comfortable. My mom isn’t one to ask for help. To this day, my parents try to protect me from the unpleasantries and uglies that life has to offer. I had been calling a couple times a day to see how mom and Ba were doing. Everyday I would ask “should I come?” and my mom would say “No, I think it’s ok. The nurse says it’s not time yet.” I hadn’t been to their house in two days and I called, thinking that I’d go on Friday (it was Thursday). Sounded like Ba was ok, no big changes. I asked, “should I come?” and to my surprise, my mom said “Ya, why don’t you come.” I don’t know if she needed me or maybe she had a feeling. So my husband came home to watch the littles and I went. She wasn’t able to talk much at that point. She was in and out of sleep from the morphine. She could communicate that she wanted water but had a hard time drinking from a straw. She vomited. I went to get a syringe to make it easier to give her water. I was in the room and noticed that her breathing was slowing down. I got my parents and we were all together. My mom told her we were all here and that everyone had been coming to see her. In her last breaths I fed her holy water from the Ganges River. Then the breath stopped. It was over. It wasn’t dramatic. It wasn’t traumatic like we had been fearing. It was just…over. I had never seen a dead body. I didn’t know how I would handle it. I didn’t know if I COULD handle it. But it was one of the most natural things I’ve ever experienced. Having experienced this, death isn’t so scary if it’s on your own terms. Ba was 85. She made a decision about her life and how she wanted to go. In this way, she was blessed. It was her wish and that makes things a lot easier. While I’m sad for me, I am not sad for her. I’m relieved. Hindus believe that when someone dies, their soul leaves their body and begins a journey to the next body or to return to become one with the universe. We actually open windows to allow the soul to leave. I don’t know what that journey is like but I firmly believe that she is at peace. Does Cloth Diapering (well, gDiapering) Save Money? Alrighty, for you skeptics, there are a few things missing from this estimation. I didn’t include the cost of laundry detergent because I used the same detergent for my diapers as I did the rest of my laundry. I DID include the cost of the special laundering products that I bought solely for the use of my diapers. This includes hard water softener, Biokleen bac-out, RLR, and Ammonia Assassin. I also included the cost of shipping/supplies/ebay/paypal fees to sell the items. It doesn’t include the cost of my time spent doing laundry or (gulp) online in the gDiapers groups or shopping for gDiapers. Let’s just say that was an expensive but fun use of my time. I had trouble figuring out how much it would cost per load of laundry. Online estimates were anywhere from $.55 to $.85 cents. I erred on the side of conservative and estimated $375 total (3 loads of laundry per week x 4 weeks per month x 37 months of diapering). Sooooo because my mind works this way, I wanted to compare this to what it would have cost us if we used disposable diapers. I applied a cost of $.26 per diaper because this was the actual amount we spent for diapers for my older daughter. Then I multiplied an average of 7 changes per day and 30 days per month times 37 months of gDiapering. Holy smokes. That’s a lot of diapers. We’ll assume the cost of wipes would be double since I used cloth wipes along with the disposable wipes we bought. So if we had used disposables for both, we would have spent $2261.48. This doesn’t take into account diaper pails or refills that would be required for disposable diapers, so the cost would be slightly higher (around another $100). We saved $1121.28! That’s exciting, right? But there were a whole bunch of other benefits. Like saving over 7500 disposables from sitting in landfills. Like not putting chemicals next to my daughters’ most delicate parts. Like using the product as a gateway to greener habits. Like finding a community of really great parents. Like seeing my kids on marketing materials for a company I believe in. And hell, like seeing my daughters in some ridiculously CUTE diapers. Your mileage may vary. My kids potty trained on the early side (about a year earlier than the US average). 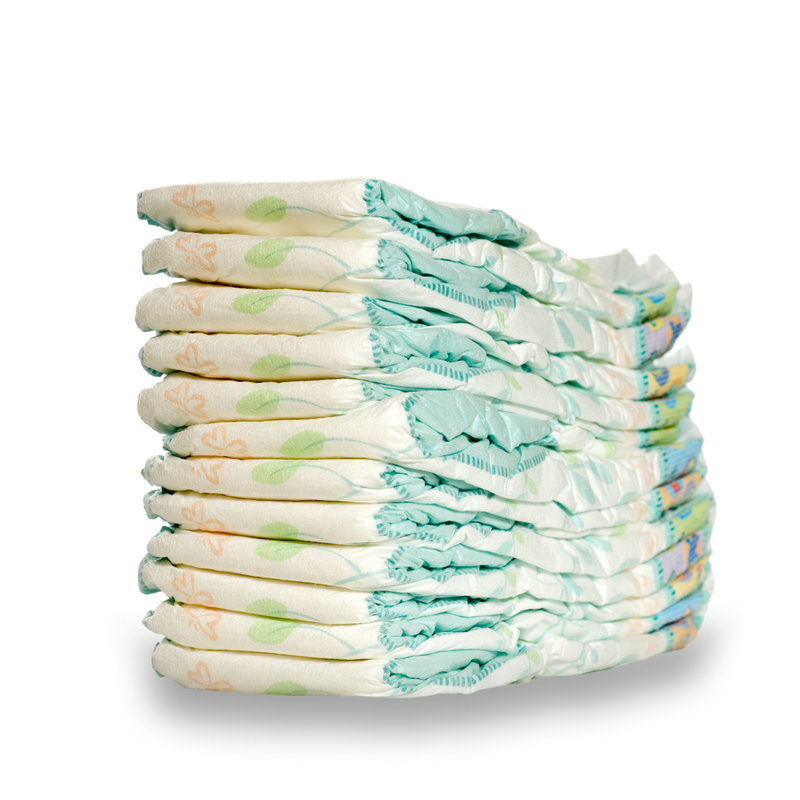 So if you’re in diapers for longer, you’ll save even more. And I was lucky with the gPants. I was lucky enough to be able to afford as many as I wanted and I bought pretty much at least one of everything I liked when they came out so I didn’t buy at crazy high prices like other moms. sent out stuff to other gMums for free and gave some pretty awesome deals but ya, there were others that I got at a discount and sold at a premium. You can’t make any money back on a disposable. If you take a look at the expenses above, you’ll also notice that a good chunk of the expense is related to disposable items like the disposable inserts and wipes. I used a lot of those while traveling and I’d say we travel more than most. So I know we would have saved a few extra hundred dollars there. And I experimented with inserts – bought the expensive gDiapers brand cloth inserts but in the end found that cheapie, $1 per insert flour sack towels worked best for us. There are definitely ways to save even more money. So my conclusion is YES, gDiapering DOES SAVE MONEY. What do you think? Did you have a similar experience? How’s my analysis? Did I leave anything out? Miss K – How can so much awesome be packed into one small body? Miss K is now 45 months old, just a few months shy of 4 years old. She weighs about 29 pounds (still), is on her way out of 3T clothes and is about 39 inches tall. She has an awesome/frustrating/adorable/messy head of curly black hair that she likes styled differently everyday. Her most frequently requested hairstyle is “one braid, like Elsa’s” because naturally, her favorite character is Elsa from Disney’s Frozen. By the way, I think it’s total BS that all girls want to be Elsa. She’s not the one who faithfully tried to reconnect with her sister or the one who had an amazing adventure, or who took fate into her own hands or the one who was strong and actually saved herself by a true act of love for her sister. That was all ANNA and yet…Yet all the girls love Elsa (who, by the way, did barely anything but shirk her familial responsibilities to live in her ice castle so she could dress and walk around more provocatively in her own solitude). I digress. Karina loves all things Frozen. She is able to read. I’m so happy to see her reading to herself now, not just reading books when we take them out and look at them together. She’s also writing and can write her name. This learning was really strange. I would occasionally try here and there to see if she would try to write letters but she wasn’t interested or maybe wasn’t able so I would drop it. One day I tried by taking out a dry erase marker and her easel. She wrote the entire alphabet. Followed by her name. Granted a few of the letters were goofy but she did it. She knows the oceans, continents, etc. She is learning about world geography by doing a world puzzle. She likes to hear about what countries are on what continents but she sometimes calls them states. It’s confusing. Also has been asking to see videos on skeletons and keeps referring to her ibia (?) and fibia (?) and likes to talk about how big her femur is. Here’s a picture of her in my glasses. So very intellectual, pensive, and mature looking. 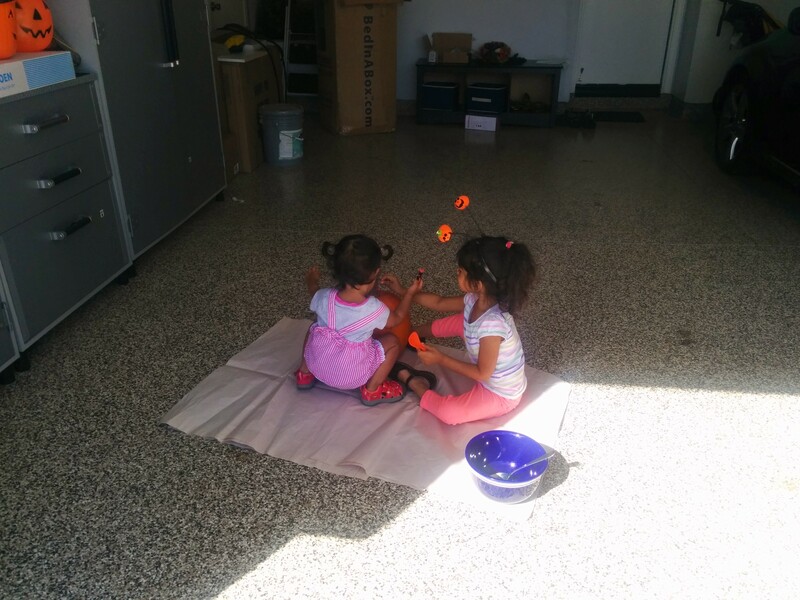 She is making friends at school – she is starting to play with the same few kids every day, it seems. She’s not just singing songs but also changing the lyrics to amuse herself and me. Miss K. goes to gymnastics once a week and she loves it. She’s so much fun to watch. She likes being around other kids and seems to get along well with others. 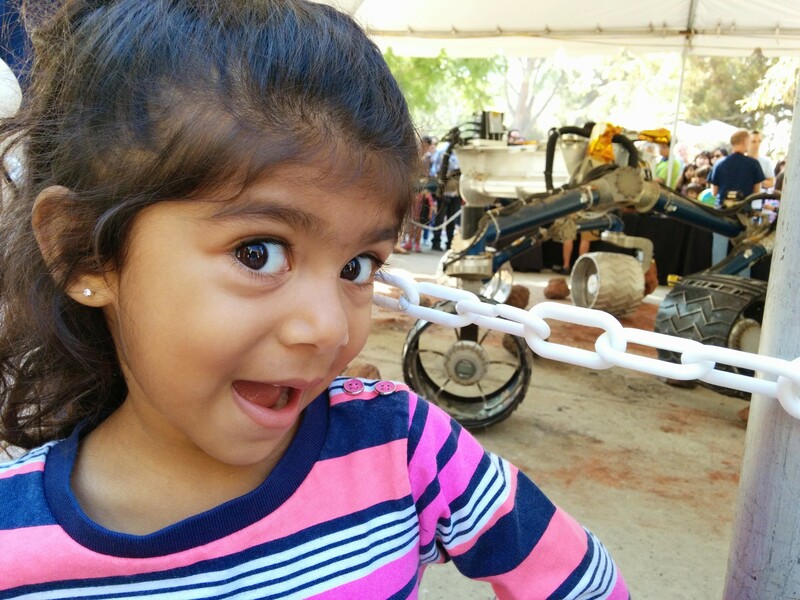 She still seems to get a little intimidated by loud noises or crowds of kids but her curiosity typically overshadows any shyness she might have. Over the last few months, she’s started drawing people and objects. Her favorite activities these days seem to be playing in the sand (she’s no longer painting EVERYday at school), puzzles (man, this hobby is back with a vengeance), books, crafts involving tape, and caring for ailing stuffed animals. 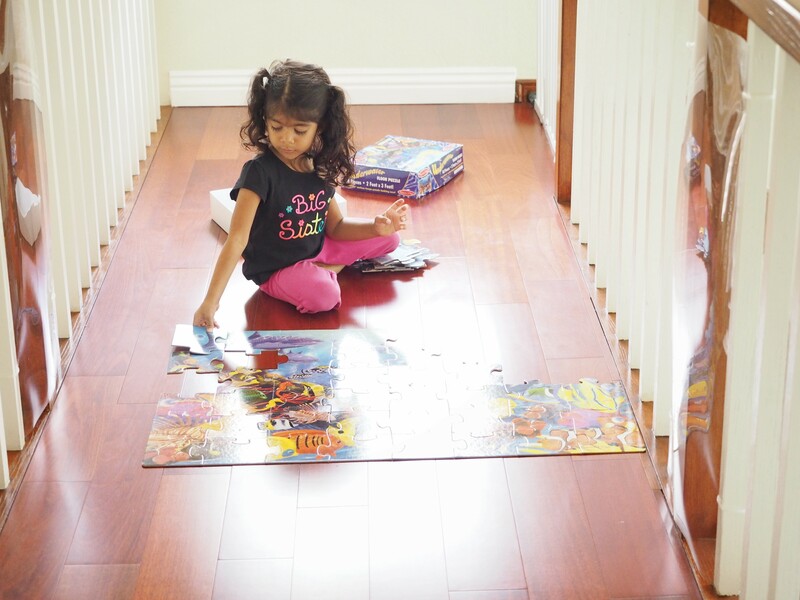 100 piece puzzles are the right level of challenge for her. She can climb into her carseat and buckle two of the three buckles herself. And for some reason, she’s still never tried to unbuckle herself. How great is that? Also enjoys helping me with preparing food and making her own pretend meals. Some of her favorite foods are grilled cheese, burritos, yogurt, peanut butter or sunflower butter sandwiches, fish, and rice. She’s fancy. She likes sea bass. Seriously. You should see her put away fish. It’s nuts. Surprisingly, she still loves oatmeal. Hands down she consumes more oatmeal than anyone else in our family. She likes most breakfast foods but most often asks for pancakes. Still loves pretty much all fruit and wants treats all day, everyday. She’ll take any treat – muffin, cookie, cupcake, ice cream, icee…she’s not particular. The nice part is that she’s usually accepting when we say that she’s had enough and toss a portion of the treat. She tells me some things have too much sugar and I shouldn’t eat them. I can’t argue sometimes. Favorite veggies are carrots, peas, occasional broccoli, and sweet potatoes. Says she likes cauliflower but then doesn’t really eat much. She’s become a really great little helper lately. She actually helps me put away laundry, make beds, unload the dishwasher, and she’s gotten really good at folding dish towels (bonus is that she’ll put them away after she folds them!). She can dress and undress herself, washes her own hands/face, and brushes her own teeth but I still do her hair, give her a bath (though she’s close to being able to do most of it herself, I think), wipe her bottom after she goes number two. She still says “I yuv you” instead of I love you. And Yuca instead of Luca. She thought Cheryl’s name was Cherub. And she often ends sentences with “or sumsing like that.” She’s been saying “OH. MY. GOSH.” a lot as well as “That’s crazy!” and “Are you SERIOUS?” She may have picked up a few of those phrases from me. Lately her dad’s been playing the Wicked soundtrack and she like Defying Gravity. He told her that the person who sings that song is the same person who sings Let It Go from Frozen. So now she keeps referring to Elphaba as Elsaba. Our biggest challenge with her right now is her choosing to not listen to us. We know she’s ignoring us sometimes and it can be infuriating. Also, she’s no longer napping most days so by the end of the day, she can get pretty cranky and thought of taking a bath is too much for her to handle. She seems to do well when we give her choices, so I use that strategy often. Oh, and I wish she’d eat more vegetables (says every mother everywhere). She’s getting so big. A couple weeks ago, she woke up from her nap and was a little weepy so I picked her up and held her and she fell back asleep. Instead of putting her down, I just held her for long while. It occurred to me that it had been ages since she had slept in my arms like that. Ironically, just three short years ago, I was beside myself trying to get her out of my arms for sleep and here I was, soaking in her deliciousness and filling my tank. The other day I looked back at her in the car and something about her expression reminded me of when she was a baby. I was so happy to see that face again but it made me a little sad, too. Made me cry. She still moves me with her kind heart and the way she just skips and jumps and sings and smiles for no reason. She’s a great kid. Please, god, or whoever or whatever oversees this stuff…PLEASE don’t let me mess her up. There’s no doubt that she’s something extraordinary. We had a phenomenal Halloween this year. Earlier this week, I read a quote from a guy that was featured on Humans of New York (if you’ve never followed this guy and like human interest stories, give it a try. The images and quotes are so gripping and interesting). He said something to the effect of “things aren’t magical when you’re an adult like they are when you’re a kid.” That stuck with me because it’s kinda true. There aren’t a lot of things that bring you sheer delight or that consume you to the point of elation when you’re an adult. Or maybe it’s just me. But I am finding that I have a lot of moments or days when you just feel good. And you feel like life is good. And that everything is going to be ok. And that things are good. It happens a lot more now that I have kids – maybe their magic moment feelings are radiating onto me. I dunno. But Halloween this year was kind of like that. It started with decorating. I had bought a few Halloween lawn signs to put out and my SIL brought us a few more along with some decorations for inside the house. We also had a skeleton for the door. Miss K. really enjoyed putting those out. So much so that when we were done, she went to the edge of the driveway and started yelling “Neighbors, come look at our Halloween decorations! Come out! Come look!” Then I bought some scarecrows and put those out but one fell over so I asked Mr. Crunchycake and Miss K to go fix it. Apparently one of our neighbors was talking nearby and Miss K asked her dad, “Who’s talking, dad?” And he told her it’s one of our neighbors. My sweet little girl whispered back “Are they talking about our Halloween decorations?” I just love her. Her aunt brought a couple small indoor jack o’lantern decorations that have a light inside. They keep getting moved around because Super S really likes them and brings them over all the time for me to turn on for her, wherever we are. But I keep finding them in front of Miss K’s Laugh n Learn House. She puts them out in front of the front door, as if it were a real house and real pumpkins. So cute! 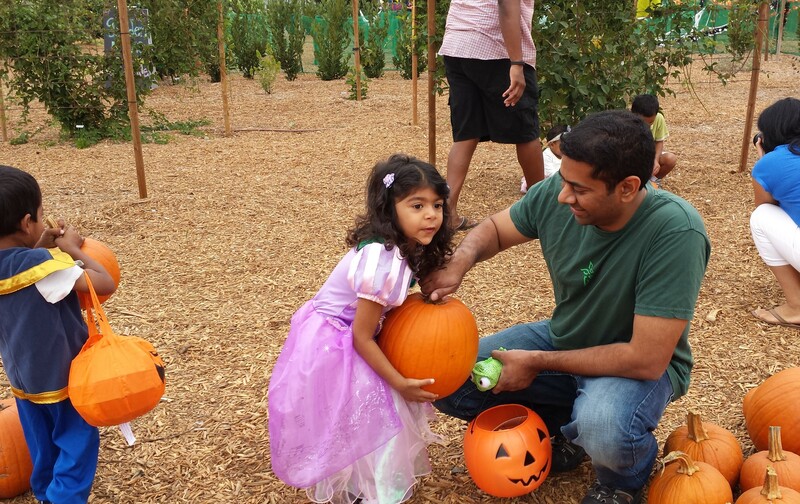 Miss K and her cousin went to a pumpkin patch event a few weeks before Halloween. Super S and I didn’t go because we had just started potty training her and I wasn’t ready for that long of an excursion. 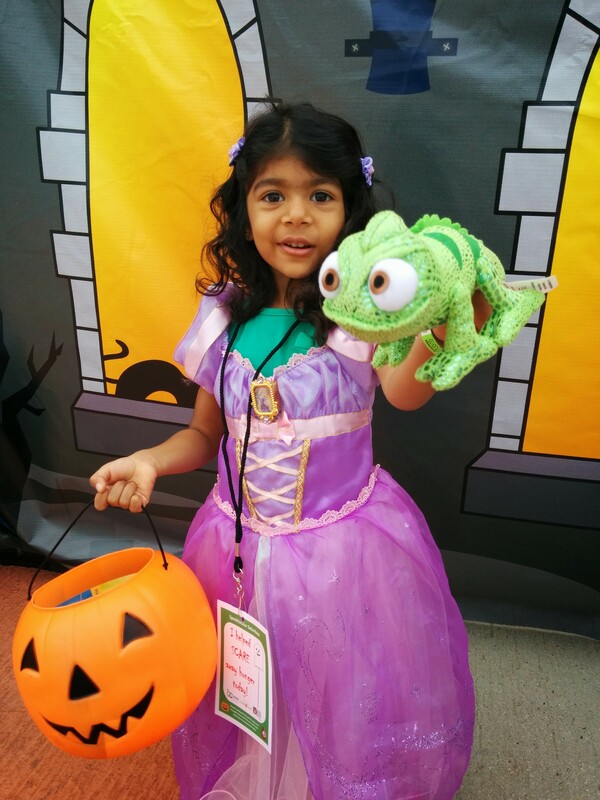 I didn’t have a costume for her yet so we put her in her Rapunzel dress and gave her a stuffed version of the little chameleon sidekick, Pasquale. 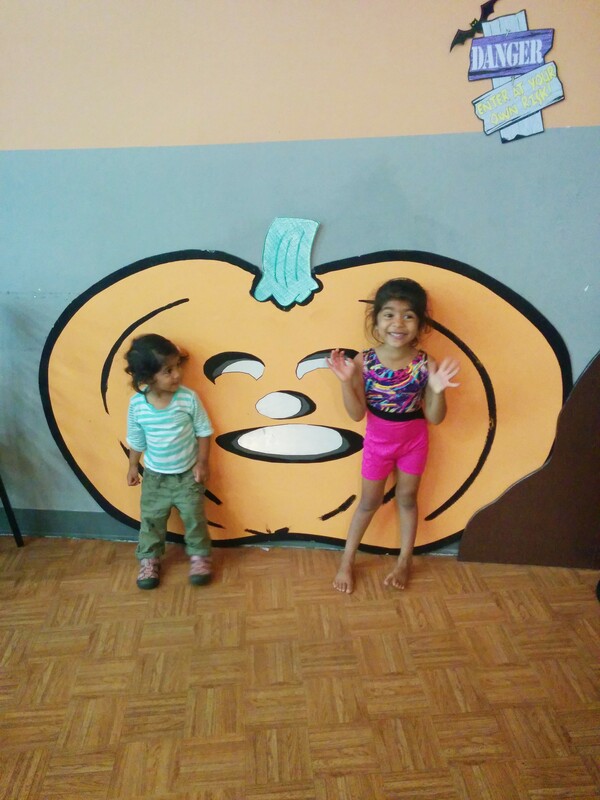 It sounds like she had a really good time – she decorated a pumpkin with googly eyes, jewels, a feather and a pipe cleaner. Ya, I don’t know…she was really proud of it. We put it out on the front step until the day before Halloween when we carved it. I really thought the kids would enjoy watching me carve the pumpkin but they weren’t all that interested. They kept running off. Miss K did help me make some artistic choices – she was adamant that the nose should be round. I can confidently say that pumpkin gutting and pumpkin carving are not on the list of things I’m good at. And can I just say how awesome it is that Miss K shares my love of pumpkin headbands? Super S was really excited to put on her costume after seeing her big sister in hers, although she didn’t really get it. Instead of putting on the hat that I made as part of the costume, she kept trying to put on her pink polka dot sun hat. Eventually she did put in on, though and shockingly, she didn’t mess with it or take it off the entire time she was trick or treating! One thing that was nice about Halloween this year is that it actually felt like Fall. Living in Southern California, we’ve had some ridiculously warm Halloweens so it was refreshing to feel a slight chill in the air. Since we’re new to the neighborhood we live in (and because we’ve never really had any trick or treaters in the places we’ve lived), I wasn’t sure if we’d need much candy. Based on the scant Halloween decorations, I didn’t think we’d have all that many. 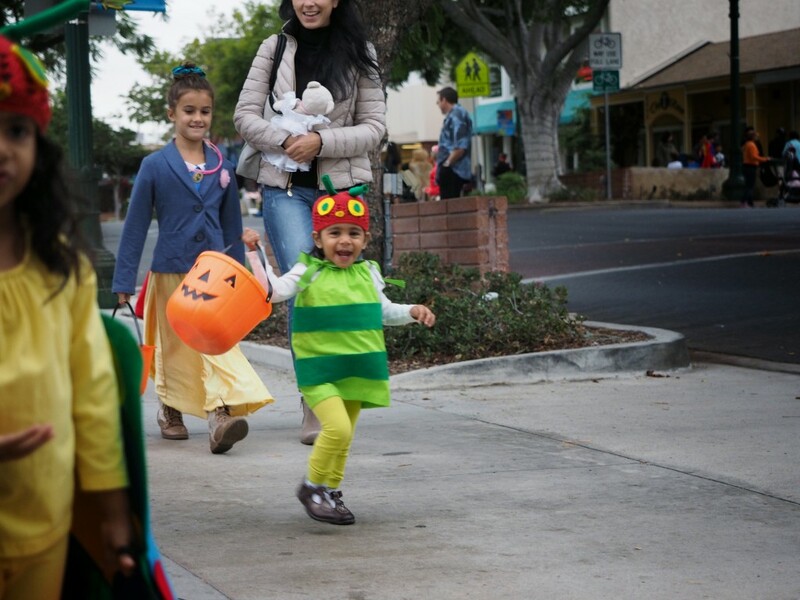 So to ensure that we’d be able to give the girls some Halloween experiences, we went to a street in our city that has a bunch of small retailers and restaurants that shuts down the street for trick or treaters. It’s really nice. We went for about an hour and it was perfect. We got to see a whole bunch of awesome costumes. My favorites were a little boy dressed as Cookie Monster with a Batman mask and a Superman cape and a woman dressed in an In n Out uniform holding her baby who was dressed as a hamburger. I also saw an itty bitty Wonder Woman that I loved – tiara and all. I was so relieved that people actually knew what the kids’ costumes were and we actually got compliments. The day before Halloween I was seriously contemplating going to Target and buying them something instead of putting on the costumes they had made. Miss K loved going up to the vendors and saying “Trick or Treat!” and even little Super S put out her little pumpkin. It was nice that they got some treats but not too many. And the girls loved seeing all the costumes. We must have seen at LEAST 20 Elsas and 15 Annas. We also saw a creepy Papa Smurf. The girls really enjoyed themselves and right when we decided it was time to go home, it started sprinkling. Perfect. We went home, listened to some Halloween music, had some dinner and we actually had trick or treaters come to our door! And they were little kids for the most part, not scary teenagers! So everytime the doorbell rang, we got excited and ran over. There were probably 15-20 groups, which is exciting for us! Karina showed off her costume to a few of them. We met a few neighbors, which was nice too. Next year we will trick or treat in our own neighborhood for sure. In between visitors, the kids were playing and were just happy. They were running and jumping on their dad. Miss K wanted to watch Madagascar so that was on and little S went to sleep without too much of a fight. At around 8:30-8:45 we were starting to really worry that we wouldn’t have enough candy but then soon after, it started to really rain so no more visitors. 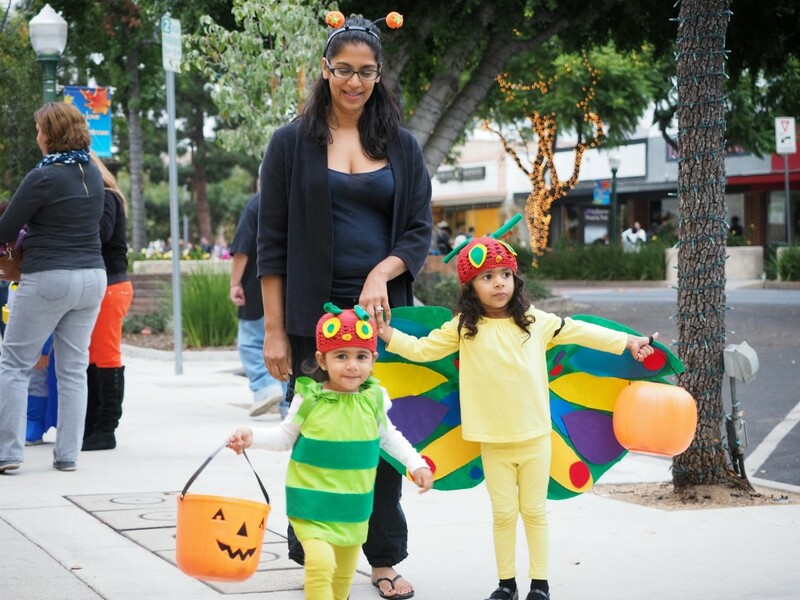 All’s well that ends well – trick or treaters start winding down around 9:00, right? We ended up giving out some of the candy that the kids had scored on Montrose so we didn’t even have a ton of candy that none of should be eating. Seriously, it was a near perfect Halloween. This crunchy life sure is sweet. I’ve been horribly neglectful of the blog lately. Actually of both of my blogs. I don’t know what it is…I feel like writing. But I don’t. I want to get some thoughts down. But I don’t. I’m not horribly stressed. But I don’t blog. Hopefully that changes. There’s been a lot going on the last few months. We bought a home and are getting to celebrate our fourth Halloween with kids. Every year for the last four years we’ve been somewhere different so I’m trying to find out if kids actually come to trick or treat in these parts. I’m hoping yes. My kids are growing up. Miss K is a few short months away from being FOUR.YEARS.OLD. How did that happen? And Super S? She’s 20 months old! They’re both awesome kids. I’ll do an update post on them. What else? Hubs is working hard, doing great at his job and going to school part time on the side. I religiously worked out from June through most of August and lost 7 pounds and 12 inches from all over my body. That was an awesome feeling. More recently, I’ve started slacking and need some motivation to close out the year on a high note. I’m cooking more frequently than a few years ago but am convinced that I can’t cook. It seems that I’m the only one around here who enjoys my food. Side note: it really blows when you spend time and effort researching, shopping for and preparing meals and no one wants to eat it. I honestly cannot remember the last healthy, well balanced meal that I’ve made that everyone liked. It makes me sad. My grandma’s health (yep, she’s still around) has been off the wall lately. I can’t help but think that maybe she’s really, actually nearing the end now. The whole situation makes me worry about my mom (her primary caretaker) and the toll all this taking on her. In lighter news, working out more often has me showering pretty much daily again (how sad that this is even news) but I still have crappy hair. Speaking of which, i just dyed it for the first time because I’m going gray. How sad. I keep losing stuff. Not insignificant or inexpensive stuff, either. Eep. Everyone in my house is using the toilet now. And that, my friends, is some awesome news. I’ll be writing about that whole potty training a second time experience too. I’m really going to try to get back on this blogging train. It’s good stuff. Maybe not for you to read, but for me to write, anyway. 1. 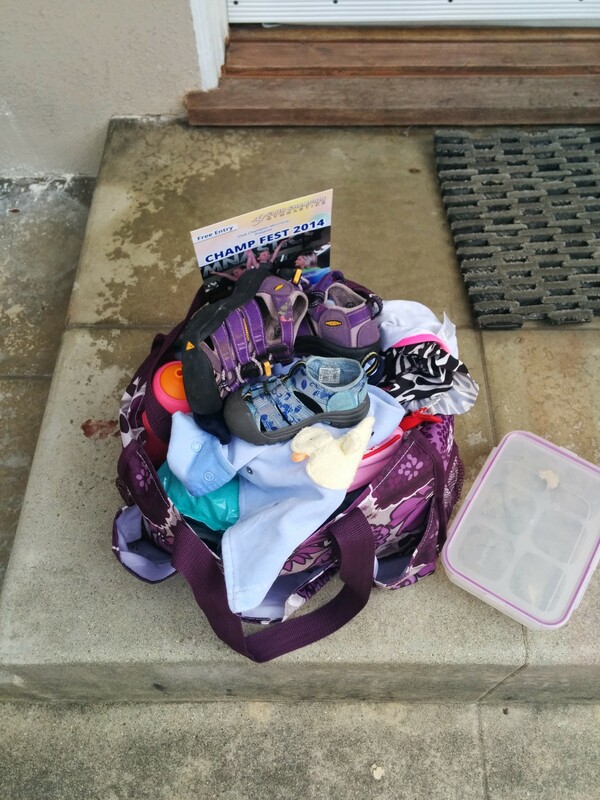 Bag full o’ crap EVERY single time we leave the house or come back. 2. 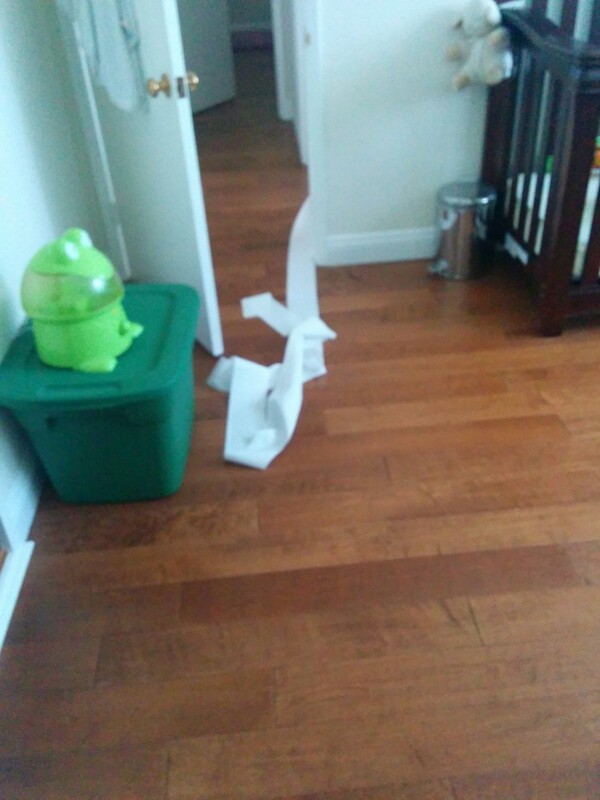 Tissue paper out the bathroom all the way into the bedroom. Why? For the love of corn, WHYYYYYYYYY??? 3. 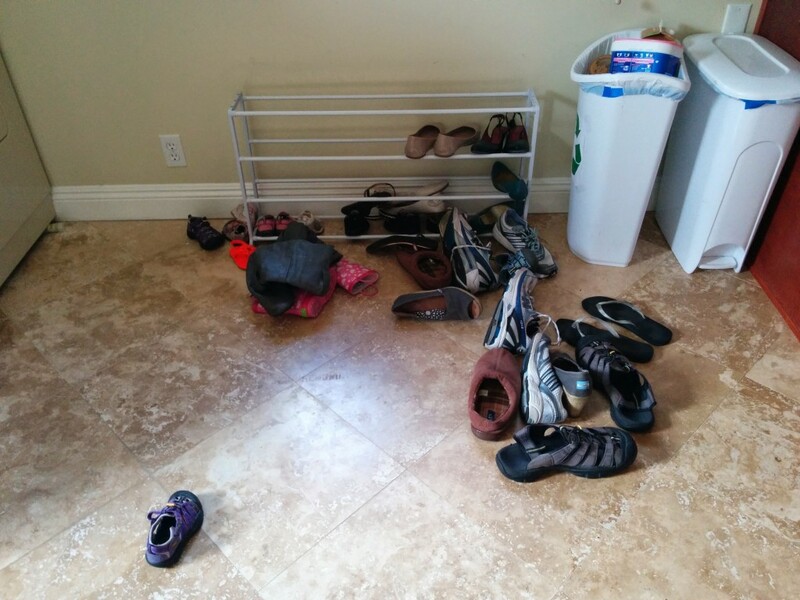 Aftermath of #2 and having to keep the trash can out of reach. 4. I have nothing to say about this one. Ok, I lied. Seriously, WTF? 5. Everyday. All. Dayam. Day. No exaggeration, I re-rack the shoes at least 3 times a day. crunchycake said That would fine! Thanks for asking first!